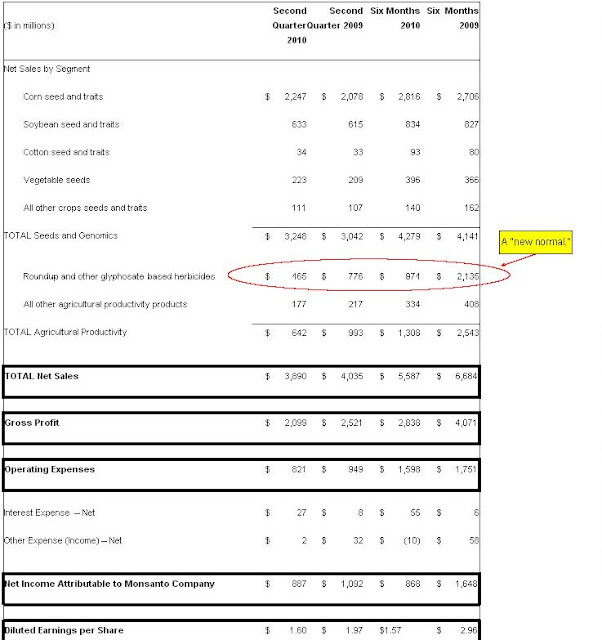 Monsanto reported fiscal q2 (ended Feb'10) earnings of 1.70 per share, about 3cents below expectations. Worse was their guidance for the full year, to come in at 3.10 versus the street's expectation of 3.28. The weaker outlook is partly due to the Roundup division, in which competing products are staying in "the channel" longer that previously anticipated. That's confusing of course, as these products could "stay in the channel" much longer than the company thinks. On this morning's conference call, management said they have recently met with over 1200 customers, some of whom are very happy and some of whom are their biggest critics. Management came away understanding that the company has put its high level goals (doubling 2007 gross profit by 2012, a number that is being tossed aside this morning) ahead of customer satisfaction, in an industry where price is becoming more of a differentiator. I say more, because Monsanto will still have the opportunity to introduce premium-priced products, but maybe not at the price or speed with which they had originally anticipated. Back to the title of the press release. Monsanto has reduced it's growth outlook, now referring to themselves as a "mid-teens" growth company. That's great, and management sounded humble and upbeat on the call this morning. That of course does nothing for investors who've owned shares over the past two years who thought this would be a 20% earnings grower, commanding an eventual 25times earnings. Monsanto is now a 13-17% growth company, and as one investor on this morning's call pointed out, that depends what the "base" for that growth is pegged at. So for now, Monsanto "gets it." They will be fighting on price in each division, and they will focus much better on their farmer customers, while letting the profit growth come "more naturally," as management put it. While they admitted to a "new ceiling" in Roundup pricing, heavy R&D spending has showed up in a strong performance from their seeds and genomics division. 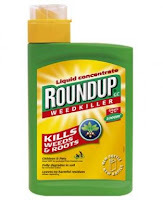 At current levels, Monsanto is getting much more interesting to me. If they truly do have premium products in this industry, their valuation will eventually return to the upper teens (on a Price-to-Earnings basis). 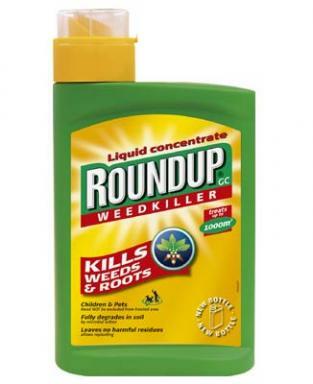 Monsanto shares have performed wretchedly versus the general market over a two year period, leaving many large investors with a bad taste in their mouth. That opens the door for those of us who wait for the right price to buy a premium brand at a non-premium price. I bought shares a few minutes ago, and I suggest other readers do the same.